Fairfield – Justin Joseph “Turtle” Lussier a lifelong resident of this area passed away unexpectedly Wednesday, June 21st, 2017. Born in St. Albans on May 11th, 1982, he was the son of Michel Lussier and Sylvia D. Minor. Justin was 35 years old. Justin was educated at St. Francis Xavier School in Winooski and Bellows Free Academy and at the time of his passing he was a machinist at Superior Technical Ceramics. He was an avid outdoorsman, whether it was hunting, riding his 4-wheeler or his horse, and enjoyed being on his motorcycle. Survivors include his father, Michel, of Fairfield, his mother, Sylvia, of Wimauma, Florida, his sister and her husband, Therese and Neal Burgoyne of Churubusco, New York, and always at his side, his cherished dog, Rusty. He is also survived by his aunts and uncles, Jacques and Marcelle Lussier of St. Albans, Albert Tetreault of Fairfield, Nicole Paine of Wells, Maine, Estelle and John Quintin of North Hero, Micheline and Earle Goodno of Candia, New Hampshire, Claire and Roger Rainville of Alburgh, and numerous cousins. 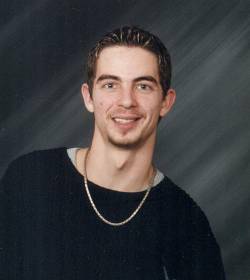 Justin was pre-deceased by his god-mother, Jacqueline Tetreault and his uncles, Real Lussier and Michael Paine. Justin’s family will greet family and friends on Monday, June 26th, 2017, from 4:00 - 8:00 PM at the Heald Funeral Home, 87 South Main Street, St. Albans. A Mass of Christian Burial will be celebrated on Tuesday, June 27th, at 1:30 PM at Holy Angels Catholic Church, 245 Lake Street, St. Albans. Interment will be at a later date in Mount Calvary Cemetery. Those planning an expression of sympathy are asked to consider the Fairfield Scholarship Fund, c/o Joy Kane, 3254 Lapland Road, East Fairfield, Vermont 05448. To send Justin’s family a written expression of sympathy or share a memory, please go to his on-line guest book at www.healdfuneralhome.com.